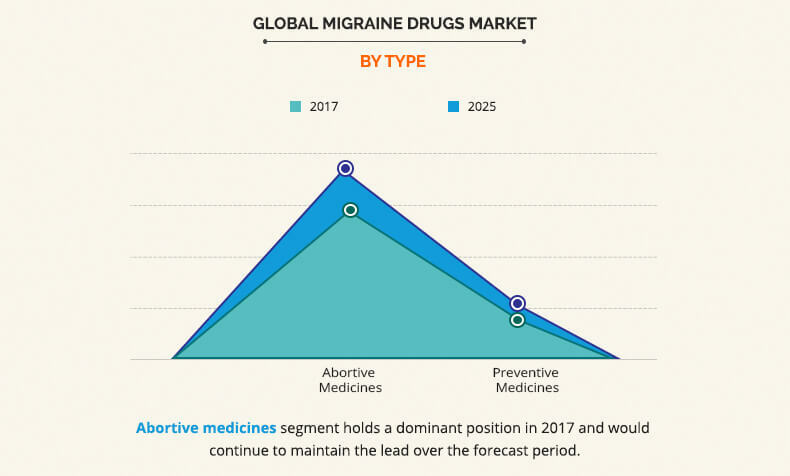 The global migraine drugs market was valued at $1,713 million in 2017, and is expected to reach $2,190 million by 2025, growing at a CAGR of 3.1% from 2018 to 2025. Migraine is a clinical condition associated with painful headaches and other symptoms such as nausea, sensitivity to smell, and others. These headaches generally occur on one side of the head and each episode of migraine has different duration and intensity. Migraine drugs are employed in the treatment of headaches associated with migraine. Rise in prevalence of migraine drives the migraine drugs market. 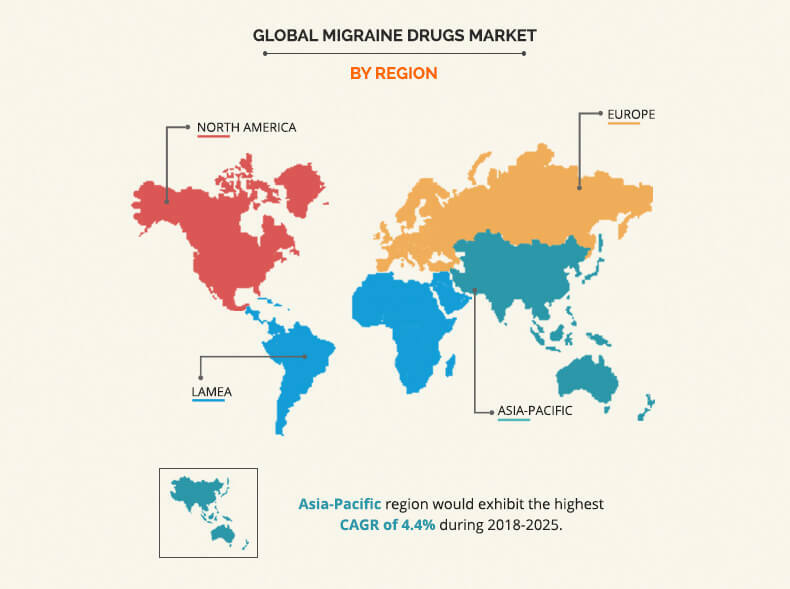 Moreover, increase in female population and surge in awareness among patients related to prevention and treatment of migraine are the key factors that augment the growth of the market. However, side effects associated with migraine drugs is a factor that hinders the market growth. On the contrary, the presence of growth opportunities in emerging nations is expected to provide new opportunities for the key players. The report segments the migraine drugs market based on type, route of administration, distribution channel, and region. Based on type, the market is bifurcated into abortive medicine and preventive medicine. Depending on route of administration, it is fragmented into oral, injection, and others. By distribution channel, it is categorized into hospital-based pharmacies, retail pharmacies, and online pharmacies. Based on region, it is analyzed across North America (U.S., Canada, and Mexico), Europe (Germany, France, UK, Italy, Spain, and rest of Europe), Asia-Pacific (China, Japan, Australia, India, South Korea, and rest of Asia-Pacific), and LAMEA (Brazil, South Africa, Saudi Arabia, and rest of LAMEA). Abortive Medicines dominated the migraine drugs market in 2017, owing to the ease of self-administration in case of patients with symptoms of nausea and vomiting along with migraine. Rise in focus of vendors on the emerging markets, such as Asia-Pacific and LAMEA, is expected to boost the market growth. Asia-Pacific is projected to witness significant growth in future, owing to rise in demand for better healthcare facilities and improvements in healthcare infrastructure. Furthermore, this region presents remarkable opportunities for the venture capitalists and investors, as the developed markets are comparatively saturated. The report provides an extensive competitive analysis and profiles of the key market players in the migraine drugs industry such as Abbott Laboratories, Allergan Plc., AstraZeneca, Eisai Co., Ltd., Endo International Plc., GlaxoSmithKline Plc., Impax Laboratories, Johnson & Johnson, Merck & Co., and Pfizer Inc. The other players in the value chain (not included in the report) include Novartis International AG, Teva Pharmaceutical Industries Limited, and Sanofi SA. This report entails a detailed quantitative analysis of the current market trends from 2017 to 2025 to identify the prevailing opportunities along with strategic assessment of the global migraine drugs market. Migraine drugs market size and estimations are based on comprehensive analysis of the applications and developments in the industry. The development strategies adopted by the key market players are enlisted to understand the competitive scenario of the migraine drugs industry. Migraines are severe, periodic, and painful headaches preceded or accompanied by sensory warning signs such as sensitivity to sound, light, and other visual disturbances. Migraine drugs are the medicines employed for the treatment of pain and other symptoms associated with migraines. The growth of migraine drugs market is propelled by rise in prevalence of migraine and increase in the awareness associated with treatment of migraine among patients. Furthermore, development of new therapies for the treatment of migraine is anticipated to boost the market growth during the forecast period. The use of migraine drugs is highest in North America, attributed to the government reforms for awareness toward migraine and rise in prevalence of migraine. North America is followed by Europe and Asia-Pacific. 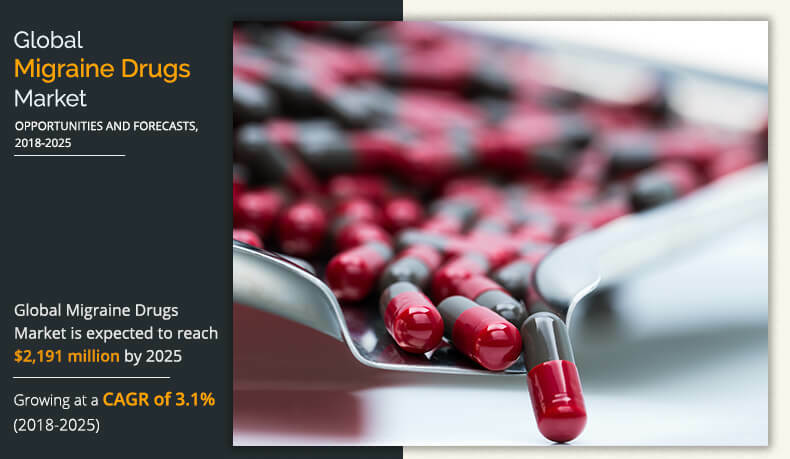 In addition, migraine drugs manufacturing companies have focused on expanding their presence in the emerging economies, which is anticipated to drive the market growth.